A marathon Memorial Day weekend of mishaps and milestones in mostly strong easterly conditions: many stalwart pilots made every day count, including some notable new (and old but rusty) locals and some bonus visitors who just happened to show up. Read on for the daily details. 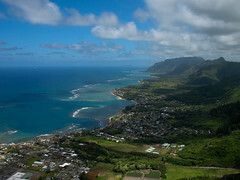 I looked at Kahana in the afternoon, but it was super east and breezy, with clouds drifting slightly offshore. I heard that Sui flew Makapuu with One-eye, in what they described as light easterly conditions that barely got them to ridge height. 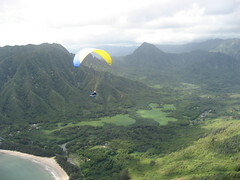 Later, Dave reported a nice downrange flight from Makapuu to Maunawili and back in glass-off conditions under a low cloudbase. Reaper cancelled his student towing session because it was too strong and east at Sandys. Jetflap and Frank hiked Koko, then tried Juice, but apparently it was too strong and east there as well. It was pretty east at Kahana but not too strong, thankfully. I joined the usual weekend dawn patrol out there. McStalker, Jim, Suicide and Ian (a pilot who has just moved here from California). After initially hanging back and watching the others launch in conditions I worried might be too east, I eventually admitted it looked okay, and I soon found myself flying to Pounders with Jeff in the lightest thermic conditions ever, and he somehow managed to stay above me most of the time. Talk about ready for the Rat Race. Thanks to Jim for picking us up. Reaper came out later to do a tandem with a new student - I'm sure we'll all be meeting him soon. Hilo Ken flew but had trouble staying up - Reaper thought he was super low and told him over the radio to make an emergency landing on the side of the ridge, but I was just getting back from my XC and I could see that Ken was still in the game, so I jumped on the radio and talked him into heading for the beach instead. He had quite an exciting time squeaking over the fishing lines and piling in behind the 12 catamarans parked on the LZ. Turns out Jiah's sailing club had come in from Kaneohe for a camping party at Kahana. She said she still wants to get back into flying but she's been really busy with work and a trip to Europe. 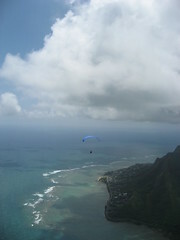 I scrambled off to Makapuu just in time to fulfill my dream of flying to the party. The wind was strong but it seemed flyable - not my favorite conditions, but we had an important mission after all. (Bellows was showing an average of 14 mph, gusting to 20.) Czech Pete, Fireman, Quentin, Jetflap and Ray all launched as well, and after hanging out for a while, watching Dave do donuts in the aerial parking lot, we headed towards Waimanalo to make history with our first ever landing at the beach near the clubhouse. I headed over first, barely penetrating without the speedbar, and trying to keep my distance from the ridgeline, but I soon bumbled into an impossibly high patch of demonic bird-infested lee-side turbulence over the shoreline downwind of Rabbit Island, at around 1500 feet. My wing went away for a sickening moment, and when it came back to join me, we fought our way back out of that swirling nastiness and promptly headed back for a landing in the strong but smooth airflow down by the Heiau. Then I had the pleasure of watching all the other guys sail away in what they said was nothing but smooth air. I felt like Moses having to stay behind and not getting to see the promised land. Thanks to Bob for snapping me out of it and ferrying me over! 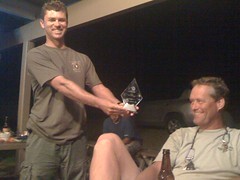 Then it was on to a wonderful evening at the HTMC clubhouse. Thanks to everyone who was able to join us for the night's celebration, and also a good discussion of some ongoing issues. For anyone that missed the meeting, the main news was that Quentin has spoken with folks at the city about ground handling at Kualoa and they are a bit more relaxed about it now - we will just have to make sure we stay downwind of the road and power lines. Please contact me if you'd like more details. Also, Quentin is working on an arrangement for us to legally access the ridge out at Nanakuli where the no trespassing signs have recently been posted out there - stay tuned for updates on that. Thanks Quentin! We welcomed Jared (new student) and Ian (California transplant) to the meeting, and enjoyed presentations of the USHPA awards we earned last year. Thanks as always to Rich for arranging the venue, and to Sui for the BBQ meat procurement and preparation. The dawn patrol started things off again: Jim, Steve, Ian, and Hillbilly flew first in fairly strong conditions, but not too strong to keep them from getting up to around 2400 above Puu Piei at times. 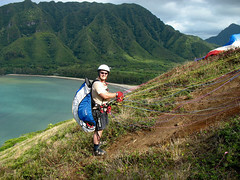 later, Sui eked his way out from the rotor behind the ridge after a disastrous launch attempt in strong conditions on a tandem with Frank's friend. Frank decided to hike down and go sailing. I launched soon after that, followed by Alan H. I toplanded as surprise visitors Mike and Ellen from SLC showed up on low launch with Scrappy and Jared. We watched the visitors fly short flights in pretty strong conditions, then Scrappy and Jared launched - I launched too and landed straightaway. I met another surprise visiting pilot at the beach, Vlad from Seattle. He said he had checked the website, and he tried to call the Vice President and the Secretary on Saturday (who are those guys anyway? ), but he couldn't get in touch with them. Next time he'll start at the top of the list I think. He said he'd try to come out to join us on Monday. Scrappy and Jared flew for a while and stayed low and out front, but as the rest of us were enjoying multiple rounds of cold beverages at the landing zone (courtesy of Frank's friend), we noticed that the wind had turned super east and nasty there. We radioed to Scrappy and Jared that they should beat a hasty retreat to Punaluu for cleaner air to land in, and we drove around the corner and jumped out of our cars just in time to see them both splash down at the Punaluu beach park surfline in nuclear force easterly winds - I checked the Punaluu sensor later and it was averaging 18 mph due east at that time. They both got their borrowed gear a bit wet - but thankfully they escaped without injury or a more serious soaking. Once again, the dawn patrol started us off at Kahana. Jim, Steve and Hillbilly flew first, in pretty strong conditions. Czech Pete and Sui came out for the next shift, eventually to be joined by me and visitor Vlad and Rich. Earlier, Sui had noticed a brush fire on the mountainside in Laie but by the time I was high enough to see it, I forgot to look for it. Conditions were light and sweet, and I was sad that I had to land on the early side. Vlad had to leave to catch a flight but he wished he could have flown longer too. My first flight of the weekend and my last flight were by far the nicest and most memorable. I guess I could have skipped the rest - but then how would I have recognized the nice ones? I'm sure I didn't cover every flight by every pilot this weekend, but hopefully I managed to hit some of the highlights. Maybe there was more east side action than I was aware of - I tried to fill in the gaps from the chatterbox. Let me know if I've left anyone out or if I am missing any exciting flying tales from the long weekend. Sorry Vlad, I was landing at the party Saturday night when you called, and I guess I forgot to call you back. Next time start at the top. Good fun, even though I only flew friday and saturday, and I apoligise for any excessive teasing I might have done. Still buzzin' from our flight on Saturday! Just enough lift to get high at Kahana, but light enough down range to make hard, but gratifying, work of it. AWESOME!